It seems that I have fallen a bit behind this week in posting about all of the great things that I have been doing with the pineapple dak bulgogi so here is another for you right away and possibly my favorite of the bunch. Quesadillas are one of my favorite foods and when you think about it they are pretty much just a grilled cheese sandwich with tortillas instead of bread and you all know how much I like my grilled cheese sandwiches . I am constantly experimenting with new quesadilla flavours and I could not pass up on the chance to make some with the pineapple dak bulgogi . Of course in addition to the pineapple dak bulgogi there would need to be some cheese to hold everything together and then I wanted something to add a bit of freshness to them and the sweet onion and cilantro relish doused in lime juice seemed like the perfect way to get it. 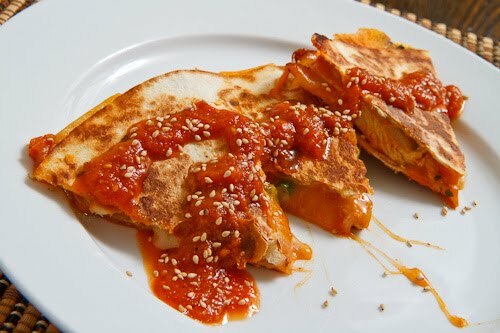 From there I cooked the quesadilla in the same way that I normally do and then I served it with a drizzle of the Korean style salsa roja that packs a bunch of flavour in addition to the extra heat and some freshly toasted sesame seeds. Once again the pineapple shines in these quesadillas and it really goes so well with the spicy chicken and melted cheesy goodness. Melt a touch of butter in a pan. Place a tortilla into the pan and swirl around in the butter and set aside. Place the second tortilla into the pan and swirl around in the butter. Sprinkle on half of the cheese onto the tortilla followed by the pineapple dak bulgogi and onion and cilantro relish followed by the remaining cheese and top it all off with the second tortilla. Cook until the quesadilla is golden brown on both sides and the cheese is melted. Serve garnished with the salsa roja and sesame seeds. Another great one, Kevin! Yum! Thank you for this wonderful receipe and great photo. I can't wait to make this dish for my family. Hi Kevin! I have an award for you over at Living the Gourmet! You are always my GO TO guy for anything mexican inspired. I believe I was put on this earth to eat as many quesadillas as I could. these look amazing! the more i see the pineapple dak bulgogi, the more i crave it. It just looks so incredibly tasty!